The scarf is a burst of bright colors. The main color is bright orange. The large flowers are in various shades of salmon with some white as well and small touches of olive green. 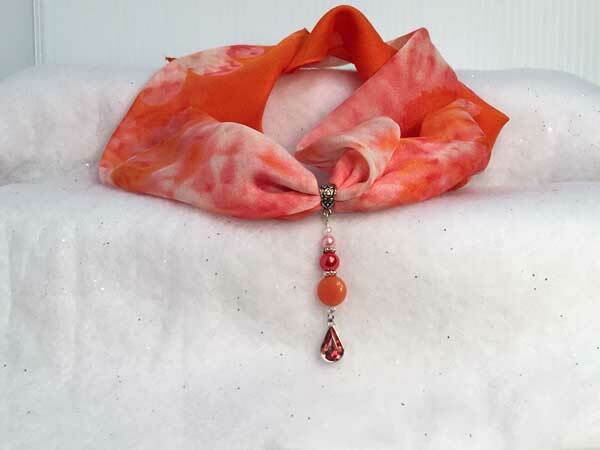 The jeweled piece for this scarf measures 2 1/2 inches from the loop of the bail. The top section has large orange button bead with white, light peach and coral pearl beads sitting on top. They are separated with silver spacers. Hanging separately from that is a beautiful, faceted coral teardrop. I've included over 30" of white ribbon that can be used to wear the dangle as a separate, coordinating piece from the scarf.